If you are looking for an Easy Homemade Clear Slime Recipe that is perfect for kids then you are in luck! 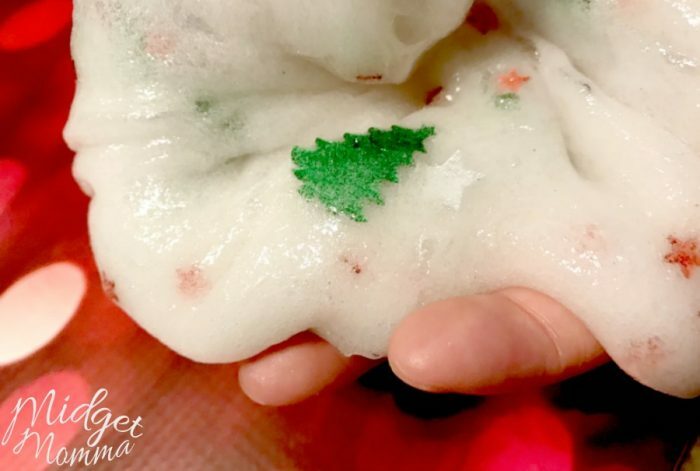 This Easy Clear Slime Recipe is decked out with Christmas spirit and super easy to make! 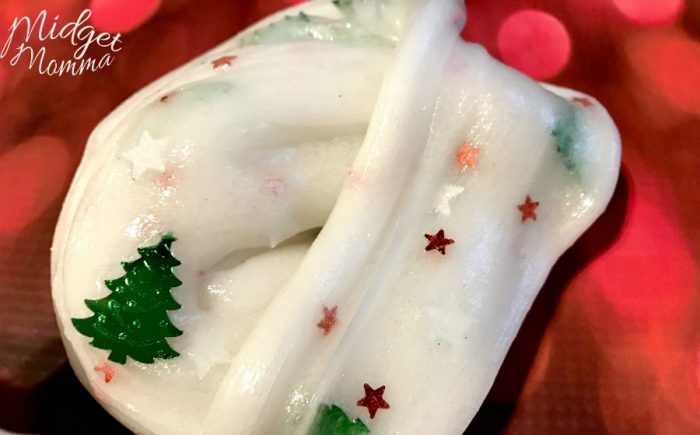 The kids will LOVE this Easy Christmas Clear Homemade Slime Recipe! This Clear Slime Recipe is easy to make. You can easily change it up depending on what you have on hand decoration wise. We are big fans of foil confetti when making slime because there are so many different options to pick from. For this Homemade Christmas Slime Recipe we grabbed the Christmas foil Confetti on Amazon. 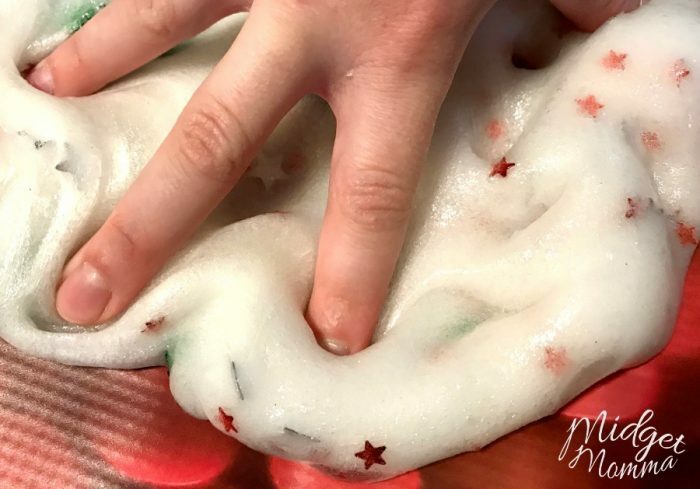 Check out our Glittery Christmas Fluffy Slime, Easy Reindeer Poop Homemade Slime Recipe and the Sparkly Homemade Playdough! We also have a lot of fun making DIY Christmas ornaments like this Santa Hand Print Ornament! If you plan on making a lot of slime, I highly suggest buying a gallon of the clear glue. It is a lot cheaper then buying the little bottles. In a bowl mix 1 cup of glue and 1/4 cup of water. Then mix well and add in the baking soda. Add 3-4 drops of green and 3-4 drop of red food coloring. Mix well and keep adding a few drops of each until you get the deep brown color. If you are wanting to add glitter you can at this point. – Alyssa likes all her slime to sparkle so she added some red and green glitter, but that is optional. Add in your saline Solution. You will want to start with 1/2 tablespoon and add a little bit at a time afterward to get the consistency that you want your slime to be. Once your slime is slime spread it apart and pour the Christmas Foil confetti into it. Then just fold your Christmas Clear Slime over and over to blend the foil confetti into your clear slime. Check out some of my other great slimes!